Note: to return to the Conservation page of John Mason's main site, please click on EXIT at the bottom of any of these pages. The following pages give some examples of the mineral sites of Wales and the reason for their importance. As a result of the Minescan project, there now exists a comprehensive network of mineral sites which represent all aspects of mineral deposit formation ("metallogenesis") in Wales. 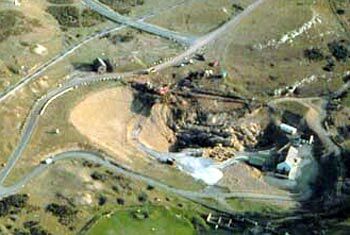 The original aim of Minescan was to look at Wales' disused metal mines and trials: the project rapidly expanded to cover other mineral sites such as road cuttings, quarries and natural exposures. In addition, a major Wales-wide sample suite was collected during Minescan and is being curated at the National Museum in Cardiff. This represents a massive "metallogenesis archive" involving thousands of hand specimens and polished sections, and is available for study by arrangement. Please contact Dr Jana Horak at the Department of Geology, National Museums and Galleries of Wales, Cathays Park, Cardiff for advice. Please follow the links below to have a browse through our diverse mineral heritage. Note that I have only had time to include a selection and that there are many excellent sites not covered yet! R: View of part of the old copper-mine at Great Orme, Llandudno, where a mining museum has been developed, much excavation done and an underground tour made available. The mine is of primary importance for its archaeology (a proven Bronze-age copper working), its geology, its metallogenesis ("copper-dolomite association") and its mineralogy - one of Wales' most important minesites!